Earlier this month, Montreal-based NanoXplore announced its intentions to become a publicly traded company on the Toronto stock exchange by what has been termed an “arm’s length reverse take over" of Graniz Mondal Inc. This transaction will amount to NanoXplore taking the place held by Graniz on the Toronto stock exchange as a publicly traded company. “You have two ways to go public: You can do it through an initial public offering. Or you can do a transaction with an already existing company in the public markets, which is a so-called shell and use that shell to become public,” explained Soroush Nazapour, president and CEO of NanoXplore in an interview with The Graphene Council. Nazapour estimates that the transaction should be completed by the end of August at which time NanoXplore will begin trading. The minimum amount of capital that has to be raised through the public offering will be $2 million. However, Nazapour expects that the company will raise capital far above that figure, which will go to provide working capital and also support the $10-million Sustainable Development Technology Canada (SDTC) program it was awarded last year. The SDTC program is an attempt by the Canadian government to develop graphene-enabled polymers that could replace metal components in electric vehicles for reducing weight. Developing polymers that have the electrical, thermal and mechanical properties of metals has been a challenge, and the aim of this project will be to see if graphene can lead to polymers with these properties. This project is expected to last a total of five years. In the video below, the rationale for pursuing graphene-enabled polymers, especially for transportation applications, is laid out. While the SDTC program could eventually lead to an entirely new business segment for the company, NanoXplore has announced top line revenues of $2.5 for the first nine months of this fiscal year. Nazapour expects that growth rate to continue until the end of the fiscal year, leading to approximately $3 million in top line revenues. These revenues are generated from the graphene-enabled buoys that are used in aquaculture industry. Nazapour expects that the capital generated from being publicly traded will support these ongoing operations as well as the SDTC program. But he is also looking ahead to further developing NanoXplore’s ambitions to manufacture graphene-enabled Li-ion batteries. In addition to the pending introduction to the Toronto exchange, NanoXplore also has a new website from when we last interviewed Paul Higgins, the chief operating officer at the beginning of this year. With the new website also comes a new corporate logo. Complimentary metal-oxide semiconductors (CMOS) have served as the backbone of the electronics industry for over four decades. However, the last decade has been marked by increasing concerns that CMOS will not be able to continue to meet the demands of Moore’s Law in which the number of transistors in a dense integrated circuit doubles approximately every two years. If CMOS is going to continue to be a force in electronics, it will become necessary to integrate CMOS with other semiconductor materials other than silicon. It appears that research out of The Institute of Photonic Sciences in Barcelona (ICFO) and supported by The Graphene Flagship has found a way to integrate graphene into a CMOS integrated circuit. In research described in the journal Nature Photonics, the ICFO researchers combined the graphene-CMOS device with quantum dots to create an array of photodetectors. While the photodetector arrays could enable digital cameras capable of seeing UV, visible and infrared light simultaneously, the technology could have a wide range of applications, including microelectronics to low-power photonics. “The development of this monolithic CMOS-based image sensor represents a milestone for low-cost, high-resolution broadband and hyperspectral imaging systems" said, Frank Koppens, a professor at ICFO in a press release. Koppens, who The Graphene Council interviewed back in 2015, believes that "in general, graphene-CMOS technology will enable a vast amount of applications, that range from safety, security, low cost pocket and smartphone cameras, fire control systems, passive night vision and night surveillance cameras, automotive sensor systems, medical imaging applications, food and pharmaceutical inspection to environmental monitoring, to name a few." The researchers were able to integrate the graphene and quantum dots into a CMOS chip by first depositing the graphene on the CMOS chip. Then this graphene layer is patterned to define the pixel shape. Finally a layer of quantum dots is added. “No complex material processing or growth processes were required to achieve this graphene-quantum dot CMOS image sensor,” said Stijn Goossens, another researcher from ICFO in Barcelona. “It proved easy and cheap to fabricate at room temperature and under ambient conditions, which signifies a considerable decrease in production costs. Even more, because of its properties, it can be easily integrated on flexible substrates as well as CMOS-type integrated circuits." The graphene-enabled CMOS chip achieves its photoresponse through something called the photogating effect, which starts as the quantum dot layer absorbs light and transfers it as photo-generated holes or electrons to the graphene. These holes or electrons move through the material because of a bias voltage applied between two pixel contacts. The photo signal triggers a change in the conductivity of the graphene and it is this change that is sensed. Because graphene has such high conductivity, a small change can be quickly detected giving the device extraordinary sensitivity. One of the key challenges in developing next-generation electronics based on graphene has been the costly and complicated processes of getting single-layers of graphene. To produce these pure versions of graphene that are suitable for the electronic applications the most common methods have been either mechanical exfoliation, in which one-atom thick sheets of graphene are pulled away from graphite, or Chemical Vapor Deposition (CVD) in which a carbon precursor is heated with the carbon condensing on a substrate such as copper or silicon. When solution-based techniques have been used in the past, the graphene is not in the form that has been proven to possess the material’s remarkable properties, like conductivity. Now an international team of researchers working together through the Georgia Institute of Technology is reporting on a new method for producing graphene that uses a gradual heating process of a single precursor—ethylene—to very high temperatures. The researchers expect that this simple and an inexpensive approach to producing graphene could expand its applications. In research described in the Journal of Physical Chemistry C, the researchers used ethylene, which is the smallest alkene molecule, containing just two atoms of carbon, and gradually heated it to 700 degrees Celsius, to create pure layers of graphene on a rhodium catalyst substrate. This work is not the first time that scientists have attempted to produce graphene by using hydrocarbons like ethylene as a precursor. Those attempts failed, producing little more than carbon soot rather than a structured graphene. The researchers were undeterred by previous failures because theoretically this stepped heating approach of ethylene should lead to the formation of a series of structures when the hydrogen atoms break away from the ethylene molecules and the carbon atoms self-assemble into the honeycomb pattern of graphene. To overcome the previous lack of success, research groups in Germany and Scotland instead of simply heating the ethylene heated the material with a rhodium substrate in a vacuum. What they found was that the ethylene adsorbed onto the rhodium catalyst, changing through coupling reactions to create one-dimensional structures of polyaromatic hydrocarbons. When these structures are heated further they go from being one-dimensional to two-dimensional materials. Just before the graphene is finally formed, the researchers observed round disk-like clusters containing 24 carbon atoms spread out to form the lattice structure of graphene. Currently, in its final form the resulting graphene structure is adsorbed onto the catalyst. While for this final structure is satisfactory for the demonstration, for other applications the graphene will need to be removed from the substrate. Australia-based Imagine Intelligent Materials (Imagine IM) was launched back in 2014 by a divergent group of scientists, engineers and business leaders that recognized that the time was right for launching a business that made devices from graphene. A couple of the keys to Imagine IM’s business strategy have been to control their own supply chain and to produce devices that really depended on graphene rather than just lending a marketing tag to a product that was not improved by graphene. To do this, they opened their graphene pilot plant in Geelong, Victoria, Australia in August 2016 with a capacity of up to 10 metric tonnes of graphene per year. This plant will provide the material that the company will use to create smart materials for detecting stress, temperature and moisture. These smart materials can be offered as “drop-in” solutions for large-scale manufacturing processes. In a the Q&A provided below, we speak to Imagine IM’s CEO, Chris Gilbey, to find out more about the relationship between their graphene production and device manufacturing and learn about how he sees the nascent graphene industry shaping up over both the short- and long-term. Q: You are involved in both the manufacturing of graphene—with a production capacity of 10 metric tonnes per year—and using graphene to make smart materials for sensing temperature, stress and moisture. I was wondering if you could breakdown your business with a bit more detail. Are you actually manufacturing devices for sensing, or are you producing master batches for other device manufacturers to make the devices? Our view is that that graphene is not a product. It’s a means to make products. And you can't make the appropriate graphene unless and until you understand what the end product application is going to be, what the functionalization requirements are, what the plant and product requirements are, etc. We want to deliver solutions...and it happens that graphene turns out to be a highly efficient way to achieve some things as long as you understand what the rules of the supply chain are that you want to work in. Q: Could you describe the graphene that your plant produces? What is the quality of the graphene and what applications is it suited for? We make multilayered graphene in the plant we have built. But frankly it’s not about the graphene. It’s about the process of developing a masterbatch material. The quality is the wrong question to ask frankly. Quality with respect to what criteria? If you measure quality in terms of size of nanoplatelets and you make platelets that are 75 microns in size hypothetically and the application requires you to make graphene that that will fit into a 50-micron fiber then you have a mismatch. Quality at this point in the evolution of graphene applications is a largely misunderstood proposition in my view. I believe that in any industry you always start with the customer need. Quality is less important than functionality and price. Rolls Royce might be a bench mark of quality in the automotive sector or perhaps they may be more correctly a benchmark of luxury. What then is quality? Back in the early days of GM the board of the company would have argued that they made quality autos. But Alfred Sloane and also Peter Drucker would perhaps have argued that they had incomplete information from the field and, as a result, made determinations that were entirely out of sync with reality! What we focus on is developing fit-for-purpose graphene at the lowest possible price, and at a location that meets the supply chain objectives of customers. At this point in time, our focus is on developing appropriate levels of conductivity in materials—in particular industrial fibers and fabrics. Conductivity is a pre-requisite of delivering sensing. Q: Is the idea that your 10 metric tonne production capacity will fulfill your own internal needs for master batches or device manufacturing? Or do you intend to sell some of that production to other companies? No point in selling graphene to anyone. Not enough sustainable margin plus volume to make it into a business. Graphene as a feedstock material is in the early stages of being commoditized. More people will bring production on line, at lower prices, and many of the players will get into a race to the bottom on price. After all, there are already Taiwanese and Chinese companies boasting of >100 tonnes per year capacity. That is not the business we are in. Q: Do you have a five-year plan on that production capacity? In other words, do you foresee that will be meeting your market needs in five years or will you have to increase capacity? What are your current operating rates? Short answer is that if our vision was to only need to produce 10 tonnes per year in five years, we would have already died and gone to heaven. 10 tonnes will satisfy one product sku in Australia. We are in discussions currently to set up a plant in the US that will get us started in that market - just started! The answer is in any event that you have to have distributed manufacturing that is close to your end use application in order to be part of mass manufacturing supply chains. I would anticipate market needs in tonnages greater than 100 tonnes for that one sku in a global scenario. At the end of the day, we want volume, volume, volume. Q: How did you come to focus on the smart materials market? Was it something inherent in the graphene that you produced that lent itself to this application area? Or did you see an unmet need in the marketplace and then tailored your graphene for this use? Actually the strategy is to reframe the concept of unmet needs and look at it through an economic lens. The intention is to become a disruptive player in mass manufacturing in the first instance and to be able to make smarter products at lower prices where we can positively impact the economics of products; i.e. there may be a need that is currently met, but if we can make a solution that radically changes the economics we get to win. Q: As one of the early graphene manufacturers, what do you see lacking in today's graphene supply chain, i.e. lack of industry standards, poor understanding among users of graphene’s capabilities, etc.? Simple answer: Certification. Industry standards are going be like legal structures for copyright. They will always trail the reality of disruptive technology. Why is Netflix such a powerhouse now? Because they figured that most people would prefer to purchase content legally than steal it, and the studios couldn't get their heads out of their backsides. However, most manufacturers don't just want for there to be a QA process. They have to have it in order to be able to de-risk their businesses. At the center of our business is the concept and the reality of certification. It’s proprietary, just as the Dolby Labs certification process is, and the WL Gore certification process is. We have just started, funded in part by a federal government grant in Australia, a Graphene Supply Chain Certification and Research Facility at Swinburne University in Melbourne. This is the first of its kind worldwide and will enable us to look at the impact of the almost infinite permutations of changes to materials that take place in the nano-domain. Q: What sort of movements and developments do you expect to see in the graphene marketplace over the next 5-10 years? Will applications become more narrow and defined or broader and dispersed? Will digital electronics become a reality or an afterthought? Any thoughts on the future? All I can say to that is that I firmly believe that applications that utilize nanomaterials will be ubiquitous in 10 years. Equally, I think there will be a massive shake out in the marketplace. One company in the UK is rolling up a bunch of the early-stage graphene start-ups that couldn't get product to market. I think that the Gartner hype curve is playing itself out as one would anticipate and there will be a tremendous amount of consolidation over the next few years. I find this area of human enterprise to be utterly fascinating! And if you read for instance, what Danny Kahneman did, when he was asked to advise the Israeli army and air forces on how to identify future leaders and how his advice ran absolutely 180 degrees contrary to what was in place at the time, and the success of his research and approach, to me that is what is going to be needed conceptually to build an industry! 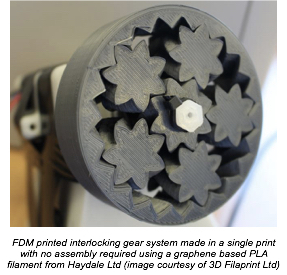 3d printing, also known as additive manufacturing (AM), represents significant potential for the use of graphene material as an additive to the fast growing range of printable materials. This is increasingly true as there is a clear shift towards producing functional parts for industrial end use, including aerospace and automotive applications. Despite being a relatively low volume market at the moment, AM has several useful properties than make it an attractive market to a graphene producer as well as to end users. The AM market has a strong appetite to test new materials and to identify innovative applications not just in the AM processes, but in the characteristics of the materials that are used. Rapid process and testing times for new products mean that there is also a low barrier to entry compared to supplying nano-enhanced materials in other manufacturing industries. Because traditional AM materials are often quite expensive on their own, adding a relatively expensive material like graphene has less of an impact on the final costs than it might in some other large scale commercial applications. One of the advantages of AM is the ability to make one-off or specialty parts with no loss in production speed. Parts are also essentially the same price regardless of whether you print a few or a few thousand pieces. Although there are a large number of different AM technologies, there are really just three formats of material, (powders, liquids and filaments) and there are three main classes of material (metals, plastics and ceramics). Graphene has the potential to add desirable characteristics across many of these technologies, formats and material classes. One of the most important materials in use with AM today is polymers. There is significant scope for graphene to gain traction and market share here as an additive, primarily due to the ease of processing graphene into polymers. Common thermoplastics used in sintering and extrusion AM techniques include ABS, PLA, nylons (6 and 12), TPU, PET and HIPS. Thermosets such as epoxy and acrylics are also popular in UV cured AM applications. Despite the relatively difficult processing challenges for metals and ceramics, there is potential for graphene to also add value across those technologies. Essentially graphene is adding benefits to or improving on the performance of a given consumable as well as mitigating or reducing the negatives. Multifunctionality is also important; gaining multiple beneficial properties without resorting to using several additives that might be incompatible with each other and doing so with a low addition rate lowers the risk of adding negative performance into a polymer, such as lower processability or brittleness. 3D Printing and AM is just another of the many areas where graphene is proving worthy of a much closer look by materials scientists, product designers, engineers and production specialist across a broad range of industries.